Q. Has phantom power damaged this keyboard? I did the sound for a new band last night and spent the first set sorting the keyboards out, which failed in the second song. I used their PA system, they ran phantom power for the mics, and everything was miked up except for the keys, which went through a passive DI box.On the second song, it was as though the gain disappeared from the keys which went crackly, weak and weedy, then just stopped completely. I changed all the leads (there were several short XLRs linked together), but I'm wondering if the cables got snagged or pulled and dislodged.I was chatting with the band after the first set and they said that they sometimes used an XLR-to-jack connection from the snake at gigs. This rang alarm bells. I said I was not happy to do this with the phantom power on, as I didn't want to risk frying the keyboards with the phantom power. After the gig, the keyboard player told me he was always having trouble with the keys and had taken them to be repaired recently, where the shop found that some of the resistors had burnt out.Was I correct in my assumption that connecting an XLR-to-jack direct into the line output of the keys would risk dosing it with 48 volts, and this is probably why the keyboard had to be fixed before? Some kind of galvanic isolation between a keyboard and a phantom-powered mic input is essential to prevent possible internal damage to the keyboard. 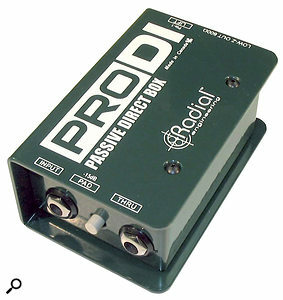 The cheapest solution is a passive DI box. SOS Technical Editor Hugh Robjohns replies: Most keyboards have unbalanced instrument or line-level outputs, and a standard XLR-TS (or TRS) lead or adaptor would almost certainly put 48V phantom power directly across the keyboard's output driver. Depending on the design of the output stage, that could result in the sound becoming weak and feeble temporarily, or it could result in more serious permanent damage. For example, the 48V phantom could reverse-bias or simply over-volt the keyboard's output capacitors, causing them to break down and eventually destroy the output stage. And that's quite possibly what happened to cause the previous internal damage to the keyboard. So it is absolutely essential to use some form of galvanic isolation between a keyboard (or guitar amp, DJ mixer, or any other electronic equipment) and a phantom-powered mic input, unless you know absolutely for sure that the electronic output is specifically designed to cope with it. A passive DI box is the easiest, cheapest and simplest solution. In your case, though, you said you were already using a DI box, and your description sounds much more like dodgy cables or connectors. If one side of the balanced connection is interrupted, you'd get exactly the kind of results you described, so I'd say it was time to get a cable tester on the band's cables!